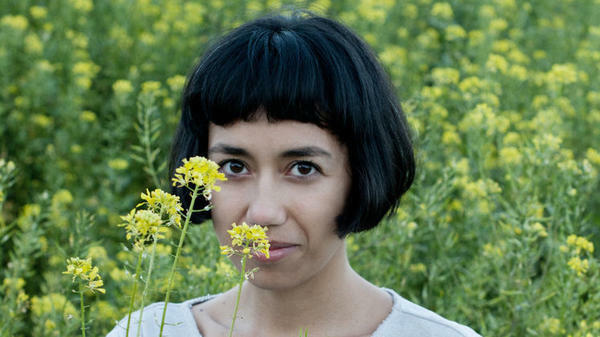 In person, folk musician Haley Heynderickx is shy and soft-spoken. She gets what she calls "sweaty impostor syndrome" when asked to talk about her music. But in performance, the Portland-based artist has the confidence to lay herself bare. Two years ago, she released a promising four-song collection called Fish Eyes that was so unguarded, it was almost uncomfortable to listen to. Heynderickx's unabashed self-assurance has only grown over time and can be heard on her latest album, I Need To Start A Garden, available now. Throughout the record, Heynderickx ponders universal preoccupations like navigating relationships and evaluating self-worth. The gorgeous opening track, "No Face," seems to ask a disenchanted loved-one, "Is it you ... or is it me?" And the electric folk ballad "Jo" finds her cradling someone "like honeycomb holding the bee in the folds." Heynderickx grew up outside Portland in a Filipino-American household. There, she learned to sing at church and family karaoke parties. She built her guitar chops at open mics where she honed a finger-picking style that is heavily influenced by John Fahey and Leo Kottke. Now that her debut LP is out, the singer-songwriter, who still teaches music locally, wants to move towards a full-time music career as a performer. But that goal seemed like stretch a year ago. During the recording process of I Need To Start A Garden, Heynderickx scrapped multiple recordings and suffered a real crisis of confidence. The artist eventually found her footing before recording "Om Sha La La," the song that would become the heart the record — an irreverent single filled with quirky non sequiturs and the lyric that became the title of the album. Heynderickx says the song is partly motivational and partly a reminder not to take herself too seriously. Haley Heynderickx is one of the new Slingshot artists — emerging talent, handpicked by public radio stations and NPR. Copyright 2018 opbmusic.org. To see more, visit opbmusic.org. All right, so we're calling this series Slingshot. NPR Music is on the prowl for buzzed-about artists regionally who might make it big nationally. And Jerad Walker of Oregon Public Broadcasting has the story of Haley Heynderickx. HALEY HEYNDERICKX: (Singing) Why am I frightened if it's all just a game? JERAD WALKER, BYLINE: Two years ago, Haley Heynderickx released a promising four-song collection that was so unguarded, it was almost uncomfortable to listen to. Like a tourist who stumbled upon a wedding on a public beach, I found myself wondering, am I supposed to be here? HEYNDERICKX: (Singing) The look in your eyes kept me sane. WALKER: In person, Heynderickx is shy and soft-spoken. She gets what she calls sweaty imposter syndrome when asked to talk about her music. But in performance, the Portland-based musician has the confidence to lay herself bare. You can hear that on her new album, "I Need To Start A Garden." HEYNDERICKX: (Singing) Face me. Face me entirely. WALKER: Heynderickx, now in her mid-20s, sings of universal preoccupations - navigating relationships, evaluating self-worth. On this track, she seems to ask a disenchanted loved one, is it you or is it me? HEYNDERICKX: (Singing) Is it the bridge between worlds that makes you feel alone? WALKER: Heynderickx grew up outside Portland in a Filipino-American household, learned to sing at church and family karaoke parties, and built her guitar chops at local open mics. With this record, Heynderickx says she's moving towards a full-time music career, which must have been scary because the sessions didn't go well at first. She scrapped multiple recordings and suffered a real crisis of confidence before finding her footing and recording this song, which would become the heart of the record. HEYNDERICKX: (Singing) The milk is sour. I've barely been to college, and I've been doubtful of all that I've dreamed of. The brink of my existence essentially is a comedy. WALKER: Haley Heynderickx says the song is partly motivational and partly a reminder not to take yourself too seriously. GREENE: That's Jerad Walker of Oregon Public Broadcasting talking about Haley Heynderickx. Transcript provided by NPR, Copyright NPR.